... Where was that guy standing to get that photo? Lol, and I jizzed in my pants xD!!! Russia, because the guy looks good and has sense of humor. Just moments before he bowled his final frame for a perfect game of 300 points, Pete's epilepsy reminded him why he doesn't bowl professionally. or Silly downs kid, retards don't bowl! DAMMIT ROMAN FOR THE LAST TIME, I DON'T WANT TO GO BOWLING! о это наш пацан! алкоголь + боулинг! Is it, tardo drops a giant gumball? Ты сука сам урод!!!!! я тебя в ротиБАЛ!!!!! 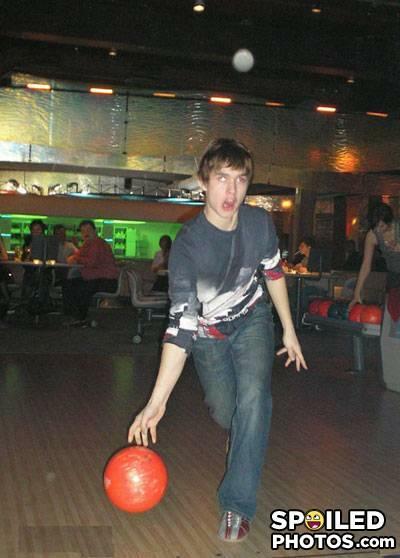 And in my spare time i like to go bowlinwooooow wwwwooooww wooow I'm wacky. Is that his eyeball flying out? RETARD DAY AT THE BOWLING ALLEY!!!! Basketball.. your doing it wrong. YOU GUYS ARE MEAN HE IS MENTALLY RETARDED AND ITS NOT FUNNY TO TEASE ABOUT STUFFLIKE THAT! Цука я тоже написал по русски какое то гавно на этой "стенке"
haha ' Zombie bowling'.. brilliant!! While I am certain that the police consider you a person of interest, I assure you I do not.